A: Choose Your Own Adventure® is now a registered trademark of Chooseco, LLC, and is not associated in any way with Click Your Poison™ books. The genre for both is “gamebook”. A: If you’re reading this on a webpage (and odds are no one printed this off for you), you can read INFECTED. There are apps you can download to read kindle books on your PC, phone, whatever. BUT! It’s also available as a paperback, so fret not. Q: Is there any way I can make this book more social? A: Yes! I’m glad you asked. Just for fun, let’s make it a decision–just like in the book. What do you mean by “social”? Q: Okay, so my zombie apocalypse plan involves a private island and a compound with ridiculous security measures, but your book doesn’t give me the option to sail away from the fray–what gives? I thought it was very well done! I didn’t cheat, and enjoyed how the story progressed, staying true to Zombie lore! There are quite a few Zombie genre e-books out there. All better than I could produce. Some great, some not so great, but they all beat watching TV these days. 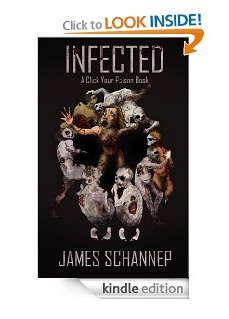 With “Infected” I feel like I got a really good Zombie Novel, that just keeps on giving! Thank you for a very interesting read, Mr Schannep! Let God sort ’em out!